After placing an idea/task in the center and connecting several categories and sub-categories to it, some people wonder whether the hour or so they put into it was worth it. Creating mind maps can be beneficial in creating a visual representation of ideas, classifying tasks, and organizing information. If used correctly, mind maps can lead to efficient problem solving and effective decision making. Want to know how mind maps increase productivity? Here are 3 awesome reasons. 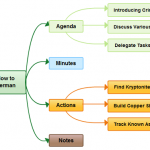 Mind maps boost productivity by allowing free flow of ideas in a controlled setting. When brainstorming without drawing a mind map, your mind may wander and you may become distracted. However, when drawing a mind map using a mind mapping software, every thought and every idea you have needs to be connected to the central idea, a category, or a sub-category. This helps you to focus on your main idea and stops you wondering off in different directions. Of all the 3 reasons this is probably the main reason how mind maps increase productivity. Simply put, if an idea or a thought cannot be connected to a category or sub category, and cannot be classified as one, it does not belong in the mind map and is therefore not relevant to the central idea. Mind maps present ideas and their interconnection in the form of images, and hence allow you to reach decisions quickly. When you read information in the form of text, your brain processes it and connects the dots. When you visualize and idea or a concept as a mind map, your productivity is improved because your brain does not have to come up with images of its own. Information presented as text can be flat, but a visual representation is full of life. Much like branches of a tree, mind maps indicate clear patterns. 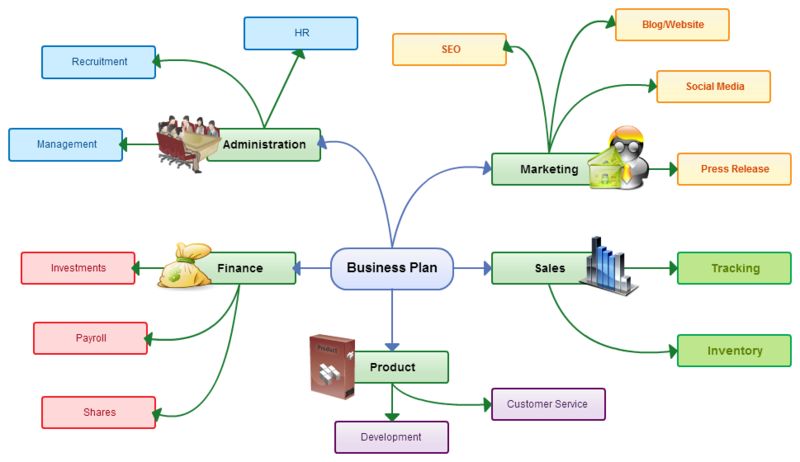 Information presented in the form of a mind map turns into knowledge and helps in the decision making process. While making and reading mind maps, both sides of your brain are functioning at the same time, allowing you to come up with well rounded decisions. By using your left and right brain simultaneously, not only do you boost your productivity, you combine intuition with logic and solve problems effectively. It is commonly known that the right side of the brain is responsible for creativity, emotions and intuition, while the left side is responsible for logic, critical thinking, analytical skills, reasoning, and language. Although it may appear as if business decisions should only be based on facts and logic, you need your right brain to come up with innovative solutions to difficult problems. Without innovation and creativity, your options will be limited. Our mind mapping tools have plenty of features to activate your right brain. I specially designed color palette is theme based so you’ll always end up with matching colors if you stick to a theme. Combined that with image export and SVG export you can easily let your creativity take over. Meanwhile, your left brain performs critical thinking and comes up with solutions based on the information illustrated in the mind map. Both parts of your brain function together, and you make decisions quickly and more efficiently. Any More Ways Mind Maps Increase Productivity ? Without a doubt mind maps can boost your productivity and can help you reduce the time of completion in different tasks. Advocates of mind mapping techniques claim that you can accomplish 20 hours of work in 6 hours simply by putting your thoughts and ideas through a mind mapping software. Although the exact amount of time you can save and the exact boost in productivity may be different for each individual, you can be significantly more effective at work by using mind maps. If you’re still undecided about using mind maps then take a look at some mind map examples found in Creately diagramming community. We made it easy to get started, just click on any image and we’ll open it for you in our mind mapping tool. The above 3 covers all the main ways mind maps increase productivity, but there could be more. If you’re using mind maps and it has affected your work in some way we love to hear from you. Do share your story in the comments section. Mind mapping is a really helpful technique. As it’s a creative process, new ideas and insights often pop up mid design. I have never tried this before, after reading your post I think I should give it a try. will update you about my results.